Crazy for Ewe – "Sale"
Cotton Lustre is on sale! Mary did a class on it, and it came out great! Great shape, great styling, and such a feel. The swatch of it lay on the table all summer, and everyone petted and drooled over it. Just gorgeous. Very smooshy with lovely drape. Amazing. I'd succumbed to Cotton Lustre's charms and chose it for my Custom Fit tank. It was so nice to work with, and it's delicious against my skin. Silky soft and really comfortable. Also worth noting, since this is a next-to-the-skin garment, Cotton Lustre is happily machine washed and dried. Just one more reason to love it. I'm cold most all the time, so I've been thinking about a wrap to go with my tank. This one is just spectacular and so easy! Color blocks are super popular, and this wrap is a great way to get look. Stylish but not too trendy, it's an easy knit and a versatile third layer you'll reach for again and again. The sample garment just happens to go with my tank, but we've put together several beautiful color combinations you'll love. You'll find out in the newsletter tomorrow morning, but I know you can keep a secret, so, I can tell you Cotton Lustre is on sale! Save 20% tomorrow through Saturday, April 23rd. If you hurry, there will be enough for a Misaka Cardigan, or maybe one of my other favorites from the Cotton Lustre book. But don't wait - how sad would you be if your favorite color was all sold out? This weekend is Mothers' Day which means all knitting and notions bags are 40% off Friday and Saturday. These make great gifts for knitters and non-knitters alike - who couldn't use a new cosmetic bag or pretty little travel accessory bag! These are the kind of thing that just make you smile when you open your suitcase or tote. Uluru is a wonderful lightweight cotton blend that's perfect for summer accessories, and now at 40% off, it's also a steal! Fine enough to be worked a laceweight gauge, Uluru makes a beautiful Citron. See how pretty Mary's is! 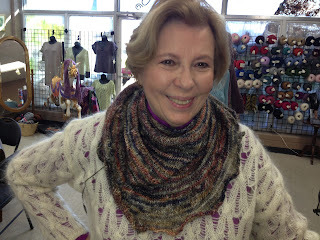 There are also two free patterns for lightweight garments that each take just a few skeins. The free pattern first is this little cropped cardigan. Takes just two skeins and fits up to a 47" bust. There is also this simple shell that would be perfect under a jacket or on its own in the summer - you could even make both for a lovely classic twin set.